At Hammerworks, our skilled artisans handcraft each Antique Reproduction Wooden Chandelier one at a time. First of all, we turn Colonial Wooden Chandeliers individually, using quality hardwoods. In addition, we paint or stain it to your specification. 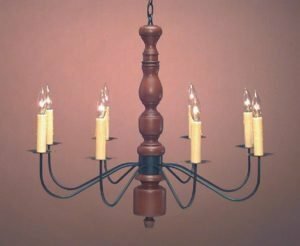 Select from several Old Village paint or stain finish options to create a one of a kind Country Wooden Chandelier. Of course, you can also supply us with any paint or stain of your own. Consequently, you can match your wooden chandelier to a specific color scheme. Also, we offer a choice of antique tin or antique brass arms. Furthermore, we supply two feet of matching chain and a ceiling plate with each rustic chandelier. Finally, since each arm is rated for a maximum 60 watt bulb, you can be sure that your period style chandelier will give plenty of light to any area. Most notably, since the CH321 Handmade Wooden Chandelier measures 30″ in width, it is most suited for a large room or open concept area. Certainly, the graceful sweeping arms lend a look of elegant harmony to your space. Furthermore, although a popular choice in period homes, an Early American Reproduction Wooden Chandelier creates a comfortable “homey” ambiance in commercial settings such as restaurants, (as shown in photo above) and retail stores. Perhaps to complement your wood chandelier, you’d like to consider one of our Colonial Pierced Tin Chandeliers. No matter which you choose, the charming hand punched design is delightful. Within this collection you’ll find pendant shades, “witch’s hat chandeliers” and ceiling lights. As always, we create these unique lights in your choice of antique tin or brass. Thus, they coordinate perfectly with any Antique Reproduction Wooden Chandelier. Additionally, the same chain, ceiling canopy and wattage specifications apply to any Colonial Pendant Tin Chandelier.